U-M is building off a number of existing efforts to address campus sexual assault with the launch of a new working group focused on enhancing faculty and staff education and training related to sexual misconduct policy, reporting and its impact on the community. And in recognition of April as Sexual Assault Awareness Month, the university will scale up ongoing outreach efforts through its educational campaign, “Support. Listen. Empower.” The campaign is designed to increase the university community’s knowledge of campus resources and reporting options, promote bystander intervention and encourage reporting of incidents to the university. “Support. Listen. Empower.” is led by the Sexual Assault Prevention and Awareness Center, which has provided educational and confidential support services related to sexual assault, intimate partner violence, sexual harassment and stalking since 1986. “We want to make sure information about resources and support is widely available, and campaigns like this help get the word out about the confidential support that we offer. We are here to help,” said Kaaren Williamsen, director of SAPAC. 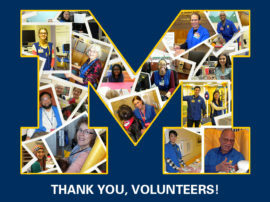 The new Working Group on Faculty and Staff Sexual Misconduct will develop recommendations for a more equitable and inclusive workplace climate by improving awareness, training, reporting and accountability regarding all forms of sexual misconduct on the Ann Arbor, Flint and Dearborn campuses, along with Michigan Medicine. Laurita Thomas, associate vice president for human resources, and Daniel Little, chancellor of UM-Dearborn, are co-chairing the group. It reports to President Mark Schlissel and is sponsored by the university’s three executive vice presidents: Marschall S. Runge, executive vice president for medical affairs; Kevin P. Hegarty, executive vice president and chief financial officer; and Martin A. Philbert, provost and executive vice president for academic affairs. “The group is fortunate to have a highly expert group of faculty and staff from all three campuses who have committed their time and energy on this important subject. Our overriding goal is to contribute to a fully respectful and inclusive environment for all members of the university environment, and one in which no individual is subject to sexual harassment and misconduct,” Little added. 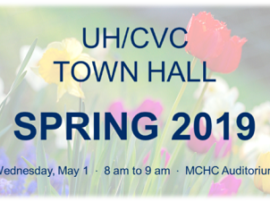 The working group will review existing programming and activities and develop recommendations for increasing faculty and staff education and training with the focus on awareness of existing policy, reporting obligations and channels, bystander intervention measures and the impact of actions on others. The group also will focus on developing recommendations for improving reporting and accountability in instances of misconduct, and improving the overall workplace culture and awareness regarding sexual misconduct. Recommendations to the president are expected in the coming months. In February, Schlissel announced the university would engage an outside expert to holistically review its policies and practices to be sure U-M is doing all it can to prevent and respond to reports of sexual misconduct in all aspects of the university community. “Although we have longstanding and focused prevention efforts and education programs, we are absolutely committed to developing approaches that will serve our university community even more effectively in the future,” he said. The review reflects the university’s strong commitment to education and prevention efforts, as well as to having fair and effective processes for addressing sexual misconduct in the U-M community. Requests for proposals from experts were due Monday, with the review planned to occur during the summer months. The university’s Office for Institutional Equity investigates all reports of alleged sexual misconduct and identifies resources and support for all parties involved in the investigation process. 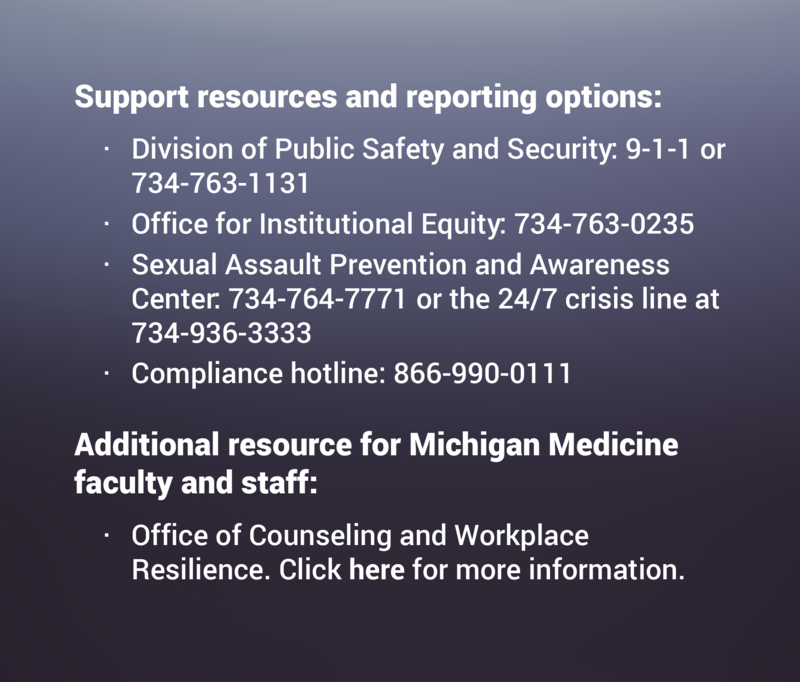 The U-M Police Department has a dedicated Special Victims Unit of detectives and other specially trained officers who can provide primary response to, and investigation of interpersonal violence crimes that are reported to have occurred on campus. These incidents include sexual assault, domestic violence, stalking and child abuse.